Don’t you love the colors in this salad? Close your eyes and just imagine the cool crisp bite of each sweet little bean! Juicy tomatoes sliding across your tongue, down into your belly! 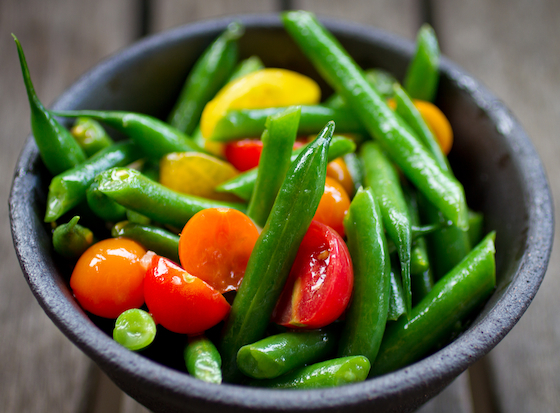 We love this recipe for Green Bean Salad and enjoy it all spring into summer. We made this recipe three times this week. That is right, three times! Yes, it is that good! We normally do not eat the same thing more than once during a given week but after eating this last weekend with our pork tenderloin, we made it again for a dinner with family and then another dinner with friends. Are we sick of it? NOPE! This salad is fresh and so flavorful. In fact, I am sure after you make it just once you will be coming back to it again and again. It goes really well with grilled pork and big juicy rib eye steaks. I would also serve it as a simple meal with a crusty baguette and a nice glass of Rose. Now, you know it is fresh and flavorful; but, have I mentioned how easy it is? 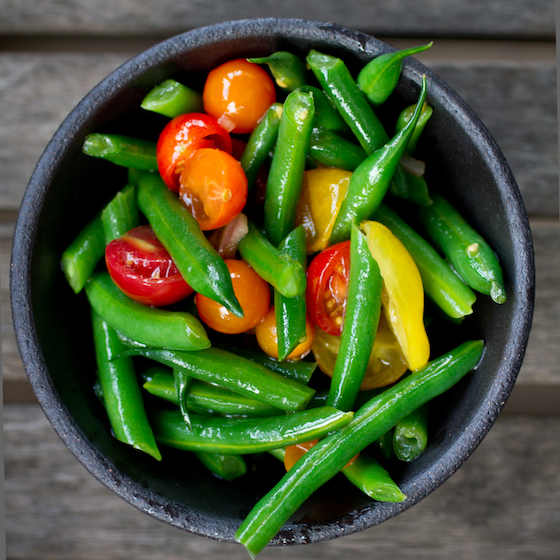 Simply blanched green beans are tossed together with heirloom or sweet cherry tomatoes, sherry vinaigrette and a sprinkling of fennel pollen, maldon salt and a crack of fresh black pepper. Really, that is it! We want to know, what is your favorite way to enjoy summertime green beans, fresh from the farm or your garden? Add green beans and cook for about 5 minutes. Have a large bowl of iced water close by. Remove the beans from heat, drain and immediately rinse with very cold water, to stop cooking then add the beans to the iced water. Let sit about 10 minutes. Drain, lightly pat dry with some paper towels and then set aside. Combine olive oil, sherry vinegar, and shallots in a small jar, cover with a lid and shake, shake, shake. Set aside. Cut tomatoes; if using heirlooms, cut in half and then quarter each half. If using cherry tomatoes, cut in half, small ones I keep whole. Place the beans and tomatoes in a serving bowl. Drizzle with the olive oil dressing, sprinkle with fennel pollen, salt, and pepper. Toss with salad utensils. Season with more pollen, salt, and pepper, if needed. Toss again, if needed. 11 Responses to "Green Bean Salad"
Give me some of that! It's so beautiful and it looks incredibly fresh (I bet it was). I've never had fennel pollen. Where did you get yours? This salad looks fantastic! Just the way I like it - a few choice (and very fresh) ingredients, simply prepared. Isn't fennel pollen the greatest? can you tell me what is the purpose of the fennel pollen? Can you enlighten me. Thanks! Yes! I love color and I love summer. The fresh vegetables is the best part. I like to make good carb meals and this is when I know that I am getting the best fresh vegetables. Thanks for this amazing recipe.